Thank you, Matthew, for this excellent report about stories from our own CSS staff regarding to their own personal migration story. I loved the comment in your report that has to do with how political immigration stories have manifested into something much different. I agree that there needs to be a shift in the narrative of how we tell the whole about immigration. At the end of the day, immigration is about the life’s of human people leaving everything they know for the safety of themselves and/or their loved ones. I strongly believe that politicians have a moral responsibility to constantly consider public policy through the eyes of human dignity. If legislation is created and if it violate the dignity of one person (male/female/trans, gay/straight, White/non-white, American/non-American, etc..) there is no acceptable explanation to pass a document. How bad does a situation have to be for you, someone reading this right now who lives in a stable enough country where your life is not in jeopardy everyday, to get up and move? One must be reminded of how fortunate the majority of Americans are to live in a country where this isn’t a daily issue. However, this means that because of our privileges (since the majority of us didn’t choose to be American we were simply born here) we must look to those that are less privileged and share our home with them. Do to others as you would want to be done to you. Thank you for summarizing such an interesting and important event so well Matthew. It is an enormous travesty when fellow Americans are exluded by hateful rhetoric and policy making by the place they worked so hard to become a part of. I think a lot of natural born Americans forget that immigrants are who built this country into what it is. America was the melting pot, and yet has never truly been welcoming to those who wish to give up their entire existence in their home to come here. It truly is one of the greatest shames America faces. This is a very interesting article, and I am disappointed I wasn’t present at this panel. I am intrigued that all three panelists were males. While it sounds like they each had very interesting points to make, I am wondering how the experience might differ for women. Especially considering the difficulty of the one professor whose sister was coming to the states, and the complexity of that process even though he was willing to pay her way through. My sister-in-law immigrated to the US from Honduras in the early 2010’s and was granted her citizenship about a year ago. She experienced unfortunate discrimination due to her ethnicity, immigrant status, and womanhood. When a border officer found one of my brother’s uniforms in her suitcase, they were very disgruntled – it wasn’t until my brother (who now works in DC for border proceedings) called that the situation was cleared up. I appreciate the argument for simplicity – we should not bolster the chase for the American dream and make it impossible for people to pursue it – legally or illegally. After reading through your report on this event, I am very sad that I was unable to attend this event. I think this event was a great idea to be put on by the college. This is a topic that can be fairly controversial in a political sense, and it is amazing that students were able to have a discussion about questions they had in an open and welcoming environment. I really like how you stated the comment about not asking questions leading to misunderstandings. I think this comment is very important because it is easy for people to pass judgments and have assumptions when it comes from their lack of knowledge and understanding of a topic or culture. How did this event influence your thoughts? What did you feel like you gained form going to this event? Thank you for sharing! Unfortunately, I was unable to attend this event due to another activity. Even so, I heard many great stories and know that everyone else had a great time. With the last presidential election, there has been a drastic increase in hatred and discrimination against immigrants. Whether or not many people here at CSS support immigrants, I think it always important to keep an open mind. Being open-minded will allow one’s self to pay attention and give a form of respect to the speaker. I do not think that we all have to agree on one idea but respecting and keeping an open mind is the most important. Thank you for the wonderful article! Thank you for summarizing an important discussion so well, Matt! I was disappointed that I could not attend the Immigration Stories forum, but I was elated to see that you produced a recap for this site in such a timely manner in correspondence with Professor Liang. I especially liked the last item you discussed in your summary; the trouble that the average students run into is the lack of understanding, once you realize you aren’t getting the real story from mass media, what questions to ask and how to find out for yourself without offending anyone. Overall I am glad that you were able to convey the discussion, but now especially, I wish I would’ve attended the event with you. Thank you for sharing this! I wanted to attend, but life happened and I wasn’t able to. I am happy that you brought up the topic of the misunderstanding that people have about immigration. There is a grey area on what people think is right and wrong when it comes to conversing, asking questions and creating meaningful communication. Thank you for sharing this at such a relevant time! Cheers! I am happy that you were able to write an article on this event because I was not able to attend myself. I felt like this would have been a very interesting and exciting talk to attend and it seems that it was. There are so many issues surrounding immigration in the United States today, and from what the three professors talked about some changes could be made. One thing that struck me as crazy is the price and length it talks to gain citizenship and just get to America, many of the people needing to come here or wanting to become US citizens do not have the resources to do so. Since they dont have the resources many end up going to illegal route and can be detained and punished for that. More communication does need to be involved so that immigrants aren’t viewed as different and hopefully can feel more American especially since many have been living here longer than I have been alive. In the article you mentioned it being brought up that more needs to be taught in school about immigrants and their experiences. I agree completely because that would help with people understanding that everyone isn’t super different and want many of the same things in life, but so many are judged before a relationship can ever be made and understanding can fully happen. Thank you for sharing about this event, I was unable to make it. However, your article is very detailed and seems to have covered a lot of what was covered. I agree with you statement that these stories need to be heard. This is a great topic to be covered during this time in our nation. We tend to no be told the entire story and only what we want to hear. This event seemed as if it was a way to open our eyes, as a citizen, and realize how our nation is. This article has extreme meaning and importance. If I would have known this event was going on, I would have been very interested to sit in and listen to the different professors talk. I think immigration is a topic that many people overlook because they believe it does not affect them. Many people in the U.S. overlook the fact that immigrants work hard to get here. They have to pass exams to become a citizen, so they have worked just as hard as the people born here, if not harder, and I think people overlook this factor. They did not just come here- they had to work for it. I think it would have been very interesting to hear a personal story from professors we know. I was unable to attend this presentation because I had to work at the same time, so I’m glad this article was written. One thing that struck me from reading this article and the comments is how unaware people are of the immigration process. I had listened to several NPR shows and Intelligence Squared debates on immigration, so I knew it was a several-year process requiring lots of money. I assumed most people knew this as well, but that doesn’t seem to be the case. Once you realize how absurd the process is, it makes immigration a higher-priority issue. However, it’s one of the many political issues where people agree there’s a problem but disagree on how to solve it, so the system is left as-it. Eventually it gets more overwhelming and leads to problems such as illegal immigration. I’m intrigued to see how this problem will be dealt with. I am so glad you decided to write about this because I never got the opportunity to attend even though I planned to make it. I also appreciate the fact that these professors were very willing to share their stories, which has allowed me to connect with them on a different level. I wish this would have been available when I was a freshman as it would have given me a different perspective. I relate more with the professor who arrived with family as a kid, which has allowed me to get acclimated to the environment, but it still involves daily act of keeping track of my tradition and the traditions of the US. I also agree with the fact that education is key because I had to learn on my own so I went out to find those answers. When people act ignorantly towards me I get annoyed because they expect me to teach them when in fact they were not trying to understand other people. Thank you for recounting this meaningful event. I think it’s a very noteworthy point that immigrants and immigration are used as propaganda. It speaks to our values and political system when we use a group of people and their plight for our own benefit. I am proud to go to school in a place that can host these type of events and have healthy conversation. I enjoyed reading this article! It was very informative and had, in my opinion, very important information. I would have loved to sit in on this talk if I had known about it. There is a lot to say about the average American’s knowledge about immigration into our country and what it lacks. In my 9th grade year, I took a required civics class and, in that class we took the citizenship test both in the beginning of the year and at the end. What was on that test, I no longer remember. However, the immigrants that are wanting to come into the country could probably tell you most of what is on that test and it would be more accurate than what I would know. I think this is one of many problems about our country. We also do not acknowledge immigration and the issues our country has been facing with it more than to use or see as propaganda for an upcoming election of some sort. Thank you for this informative and interesting article! I want to personal thank you for writing this article, for I did not have the opportunity to attend this panel. All of these professors immigration stories reminds me of my parent’s immigration story. Both of my parents immigrated from Vietnam to the United States, escaping the Communist rule. I believe immigrants come to America for a better future and freedom like my parents did. I hope people would understand that sometimes people immigrate to a different country because they do not have a choice. Escaping oppression, communist, war, and more is a reasonable explanation to immigrate. I believe having an open mind and being accepting is key to understanding others who are from a different origin. We are very fortunate to go to school with so much diversity. We even get to have professors from various cultures. It is important for people to be cultured and be open minded. I can certainly understand how our teachers that immigrated here do not feel so accepted. The president of our country has not put anyone’s mind at ease. We need to be accepting of all people no matter what culture they are from. I like that you pointed out how our teachers and others do everything a U.S. citizen should do and beyond. Most citizens are very uneducated regarding our country and others. Thank you for writing about this important discussion. I had really wanted to attend, but it didn’t work out with my schedule, so I am glad I can read about it here! Right off the bat you said that few faculty attended, and I wondered why that was? I think it’s great that many students were in attendance, but why not many faculty? I think a lot of people could benefit from listening to conversations like this one that don’t have a strict political agenda. It seems that the motive behind this forum was sincere, and I think these discussions are so important. In World History, we talked about our ancestors and how leaving home is no easy feat. I am privileged to have been born, raised, and look like I “belong” here. But I think it is so problematic that I know less about my country than immigrants are forced to learn. I know that I would benefit from a lot more education about immigration and I think your ending point really speaks to that. It’s encouraging to know that more and more people are willing to ask questions and engage in important conversations like this one. Thank you so much for summarizing the session. I also really wanted to attend this event but could not make it. I really liked reading the opinions of the professors. Even though I was born in the United States, I could also relate to the feeling of not belonging and being looked at as not American. It gets annoying when people try not to be open minded and that America is not just a country full of who they think should be considered American. I liked how the professors pointed out that immigration should be taught more. I agree with this because America’s history is built off of immigration and we tend to forget that. Overall, these types of talks are always interesting and hearing the stories of others are always inspiring. Again, thank you so much for sharing. 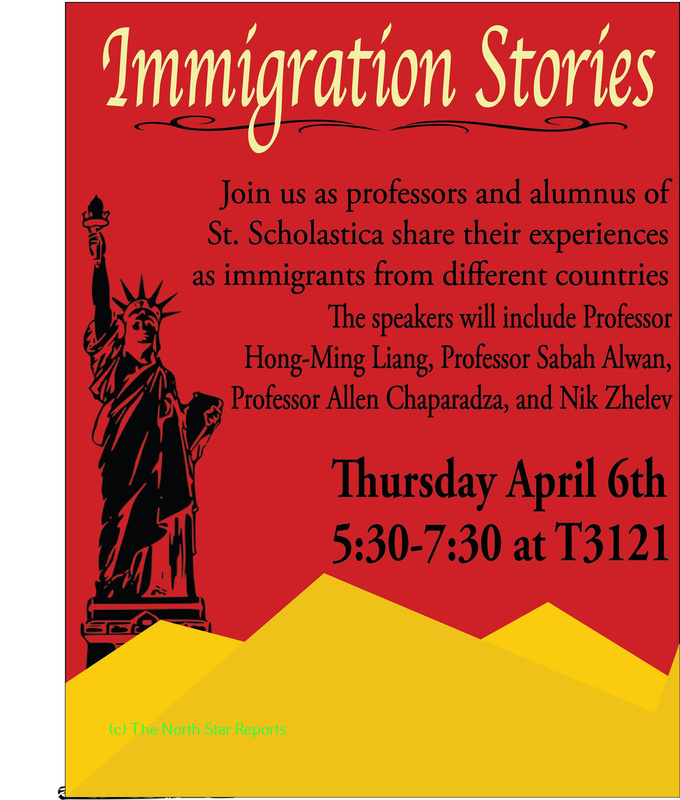 Matthew, thank you for sharing and writing a review of the Immigration Stories from St. Scholastica faculty. Unfortunately I was not able to attend the event, but I am happy I was able to read your review. I have had the opportunity to listen to Professor Liang talk briefly about the immigration process in his classes, and it sounds like a very long, expensive, and tiring process. I also agree with you that both sides of the political aisle use and abuse the topic through propaganda. I think our media only makes this problem worse. I believe it will take time for individuals to become fully informed on immigration issues (including myself), but it takes attending events such as this, listening/reading credible news sources, and asking informed questions that will change the negative connotation that the word “immigrant” currently has from the last political cycle. Wow, a fantastic read. I agree, and really like the point you make when talking about how each side of politics using fake or distorted immigration stories to push their own agenda. I loved reading it, even though I may disagree with some major points. I will not however share my views on the subject, just to avoid a politics debate from either side, left or rights. However, I did really enjoy the read, and I enjoyed the research put into it. I was so sad I couldn’t make it to this panel! What strikes me as especially difficult when discussing this subject is the fact that some of my classmates- and these professors’ students- are themselves calling for even tighter regulations on immigration (I can only imagine the potential effects this could have on their education alone). Beyond this, I agree that it is unreal to sit back as someone who has never gone through the immigration process and look at the sheer effort others are required to go through to simply live and work where they choose to be. One of the things I’ve learned most in Professor Liang’s class is the fact that borders themselves are shifting and dynamic things, due to changes in worldly power and cultural/economic blending (whether he intended this lesson or not, I do not know). Ultimately, I know that certain restrictions are necessary for security’s sake. This being said, the current system seems to treat people like our own professors here at CSS with more suspicion than a welcoming spirit, and I fear that it could negatively delay our own cultural progression as a community. (I know Matt was heading out to teach English in China this year after graduating, so his mind is likely continuing to expand in the ideas of migration.) This is a cool article because even though I recall seeing the event flyer, I was unable to attend this event. Because we are spending time this semester investigating migration, ideologies affecting it, and the implications for human rights, I found this to be a suitable article. Of course each of the three faculty are vastly different, I like the approach through common threads. The use of migration stories as propaganda for political parties is a really powerful and concerning idea. How skewed do ideas of human rights become when these stories are used as propaganda rather than learning experiences? Did these stories from the faculty make an impact on educating students about migration issues (including understanding the use of them as political tools)? If this event were held again, would you do it in the same way? Always interesting (and often difficult) to step back and look at policy and challenges in our own home. Thanks for this article. It was love reading your article, Matt. It is important to acknowledge this beautiful and necessary event that was put on by our faculty and OIP. This is why I appreciated the staff and faculty of this school when a discussion is needed some are never afraid to put it on. I also admire the fact that rather than simply having a session on migration, OIP took the time and action to get the real voice of migrants, thus giving it more power. With that said, I resonate with some of the ideas that the faculty expressed. Personally, I think the idea of American is eccentric. It is something that most immigrants have to wrestle with. The ideal definition of an American is having the freedom to be your true self-meaning identifying, practicing and believing what you want. However, this is often not the case for many immigrants for they are often met with threats or isolation. Anyways, I wonder what each professors would have said about the use immigrants as propaganda now. Also, how they would have describe the issue of identity with the current immigrants. Thank you for taking the time to evaluate this presentation. It sounds as though it was quite a good experience. I would certainly have to agree with the speakers that our education systems should do more to inform students what the immigration process is like and the role that immigrants have played in our history. In today’s political climate, it seems that some people lose sight of the dignity and worth of all humans. I believe that communication between native-born citizens and people who have immigrated to the U.S. would be highly beneficial. When you sit down and have a conversation with someone, it becomes much less likely that one will “fall” for the dehumanizing propaganda that we see too much of today. Thank you for your post. I am currently writing a project for Professor LIang on Immigration and I found this article to be a helpful resource. I agree with the argument for a points system. I find that if someone is paying taxes and not breaking the law then citizenship should be granted on a sensible timescale. The points system would accomplish this and remove the emotion from the equation. It is also good to see our CSS faculty being recognized for doing the free talks on campus that are often ignored by the majority of the student body. This article was well written and uses common language that was well understood and easy to read. Thank you Matthew! Immigration stories are so very interesting to me! We tend to look up to our teachers and mentors and it seems odd to us that they would go through things that we go through as regular people. I think it is also an amazing thing too that our college is so open and accepting of people from different cultures and backgrounds because those are the enviornments that produce the best people.